(Bridgeport, Conn., June 29, 2017) – 2015 Bridgeport Bluefish infielder Ildemaro Vargas has been promoted to the Major Leagues with the Arizona Diamondbacks. Vargas was called up from Triple-A Reno of the Pacific Coast League, where he was hitting .307 with six home runs, 43 RBI, and 64 runs scored across 73 games. The Venezuela-native joined the Diamondbacks organization midway through the 2015 season, which he began in Bridgeport. He was assigned to Single-A Kane County of the Midwest League, and finished that season with a .321 batting average, five home runs, 39 RBI, 62 runs scored, and nine stolen bases in 86 games. 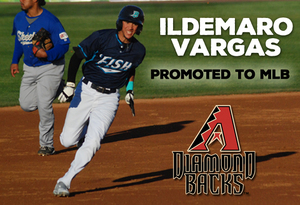 2016 proved to be Ildemaro’s standout year, as he was promoted to Double-A Mobile (Southern League) and then Triple-A Reno (Pacific Coast League). In 133 combined games, he collected a .305 batting average with six home runs, 37 RBI, 76 runs scored, and 21 stolen bases. Before his contract was purchased by the Diamondbacks organization in May 2015, Vargas was a standout player for the Bluefish. In 30 games so far that season, he was hitting .273 with eight RBI, 17 runs scored, and seven stolen bases. Vargas is now the second-ever Bluefish to reach the Major League level for the first time after playing for the Bluefish. Brock Peterson was the first to do so, making his MLB debut with the St. Louis Cardinals in 2013 after playing two seasons with the ‘Fish in 2011 and 2012.